The last morning of our trip was spent at the 9th St. Italian Market. To me this is what a farmer's market is all about. There are tons of stands selling all kinds of fresh produce and fish. I could spend a whole day at the market just browsing in some of the stores like the Spice Corner, Claudio's (more on them in another blog) and Dangelo Bros. 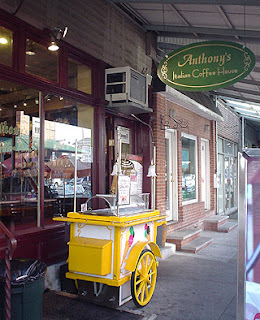 It was such a beautiful day so we decided to have breakfast outside at Anthony's Italian Coffee House. We enjoyed an espresso and a sfogiatella as we watched the market come alive with shoppers. Only in Philadelphia can a piece of board be laid on the street turning it into an outside dining area. I headed to Chinatown next for a quick lunch at the Imperial Inn. 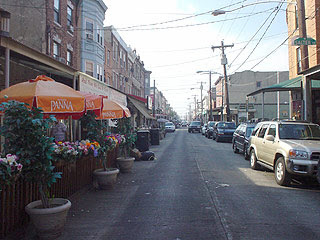 Philadelphia's Chinatown is a compact neighborhood of restaurants, shops and homes. With ducks hanging in shop windows and street signs written in Chinese you can't help but feel removed from the city when you're there. My culinary tour of Philadelphia would not be complete without pizza. La Rosa in South Philly was my next stop. There's nothing fancy about the shop, they don't even have seating, but in my opinion they make the best pizza in the area. 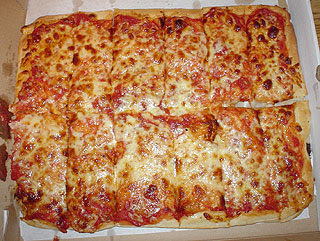 It's not thin crust but not really Sicilian either. It's a mixture of the two cooked in long square trays. I know there are others that might not agree but my vote will always be for La Rosa. Our final stop before heading to the airport was to Federal Pretzel Baking Company. One thing very unique to Philly is the soft pretzel and although there are several places that try to imitate none are quite as good as the one's from Federal Pretzel. We went with the intention of buying a few for the trip home but once inside the smell over took us and we ended up buying 30 to share with our Phoenix friends. 5 hours later and 10 pounds heavier we landed in Phoenix. I've been to Philadelphia many times over the years and have always eaten well. The Chinatown is small but nice, and I always enjoy browsing at the Reading Terminal Market. I haven't been to the 9th St. Market, but I'm attending a conference in Philadelphia in January, so I may bundle up and sneak away for a few hours to give it a try. If you'd like any recommendations let me know. Having lived there for most of my life I'm just full of suggestions.